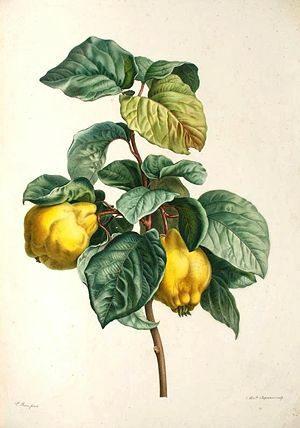 I first discovered quince about five years ago. It was February at the time, and I was looking through a Basque style cookbook for good Valentine’s sweet recipes. I came across a goat cheese and quince cake, and dedicated to making it, I embarked on a city-wide treasure hunt for the elusive quince. Unsuccessful, I ended up resorting to quince preserves that first time. I don’t recommend trying to find fresh quince in February! Quince ripen locally in the fall, along with apple season. Occasionally you can find them in the spring when they are shipped from the southern hemisphere, but they don’t keep all year long like apples do. The fruits look like furry apple-pear hybrids. They are much firmer than either apples or pears, however, and they are a bit too tart to enjoy raw. For the last few years, I have raided my local farmers markets for quince in September or October. A few farm stands carry them, and it’s always the fruit that seems abandoned, as many folks don’t know what to do with it. I buy a generous bag full and cook it into an applesauce-like consistency with a little sugar. The sauce freezes nicely to take out at any time of year. 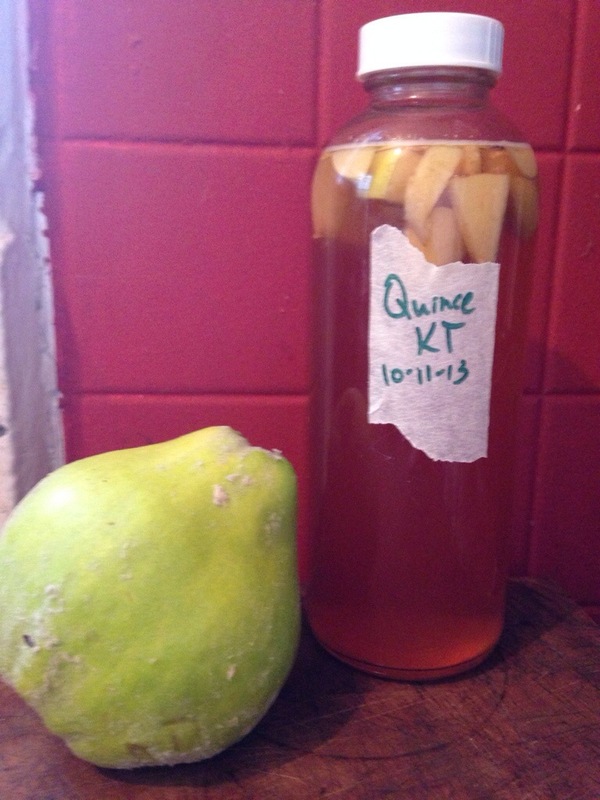 I just got my yearly bag of quince yesterday, and this morning as I was harvesting my latest batch of kombucha (see my master recipe here), I threw a few slices of the quince into one of my bottles, on a whim. A few hours later I tried the result. Wowweee! I have to make more of this stuff! Quince has the most lovely aroma, that has already permeated the brew. It’s a fruity-floral kind of flavor. Despite the tartness of the raw fruit, it’s infusion in the brew is pleasantly sweet. 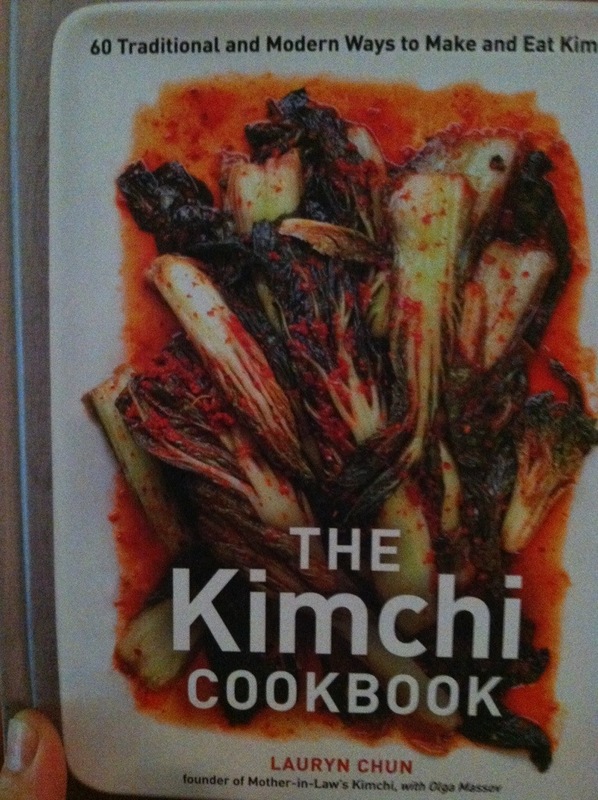 The following recipe is equally delicious for both kombucha and jun. I love it in the same way I love bubble tea: you can drink your drink, and eat it too. 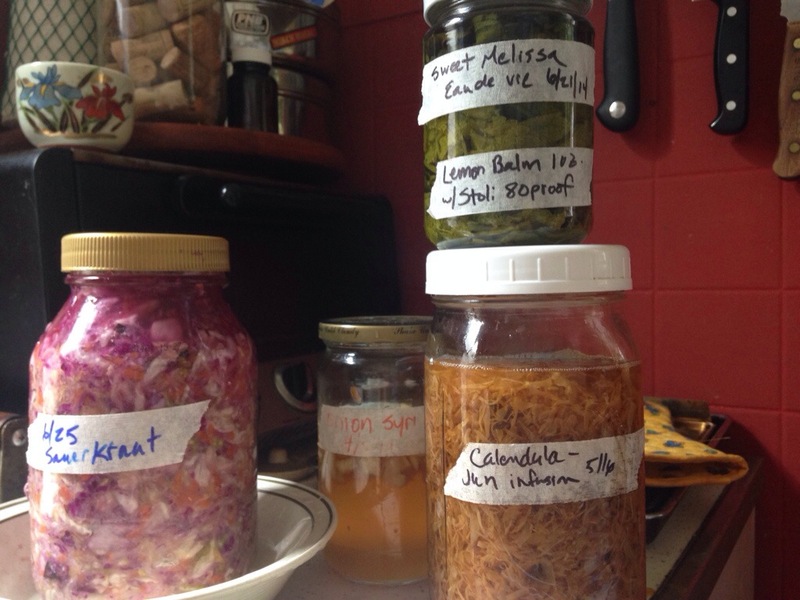 Once you’ve fermented your brew (refer to my post Kombucha 101), it’s a dump and drink creation. It also combines probably the trendiest superfoods out on the market. 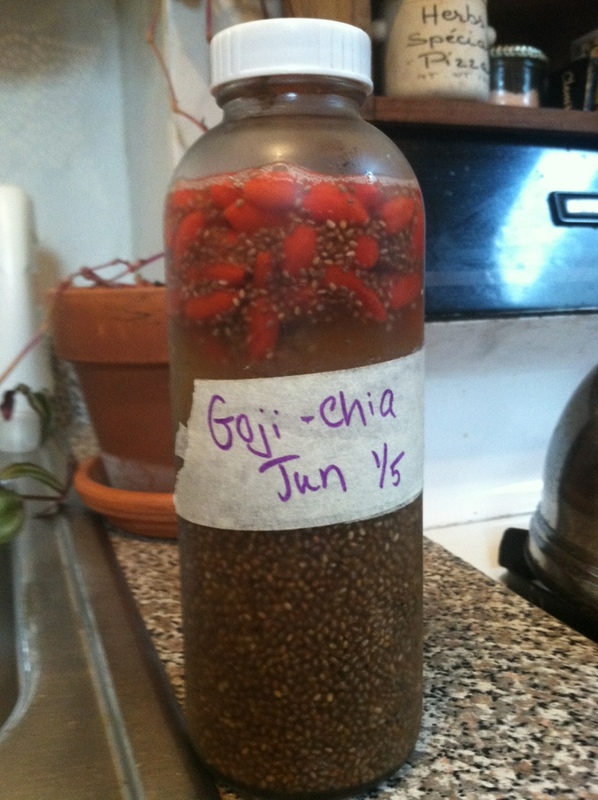 Put 1/4 c chia seeds and a small handful of goji berries into a pint-sized bottle. 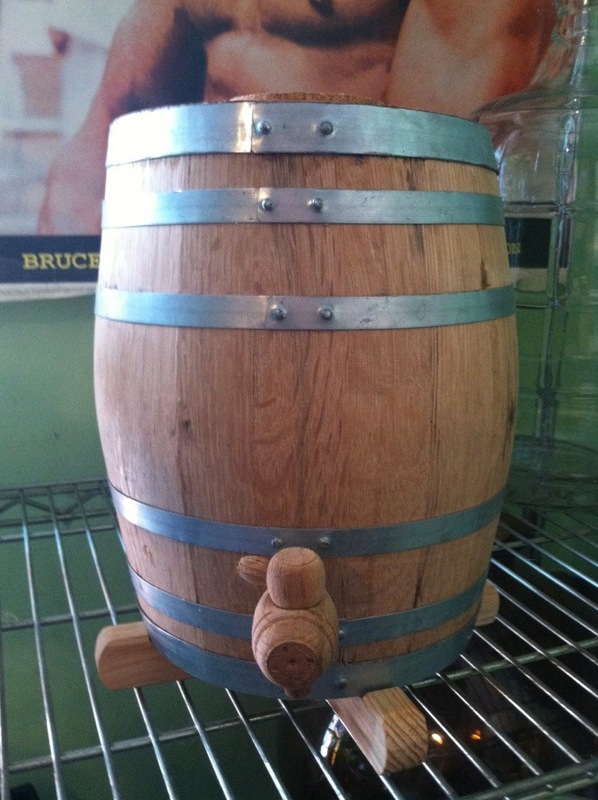 Fill the bottle with kombucha. Stir, or seal the bottle and shake gently to distribute the chia seeds. Put it in the fridge and let the mixture sit at least overnight. This will allow the kombucha to absorb the flavor of the goji berries and it will allow the chia seeds to develop their jelly like consistency. If your chia seeds stick together, stir the mixture a little more before consuming. The berries will float to the top of the mix, and the chia seeds sink. Both are satisfying textural additions to your kombucha experience. Goji berries are very high in antioxidants, have a healthy combination of monounsaturated fats, trace mineral contents, and amino acids. High in Vitamin A (in the form of beta carotene), C (note that A and C are both antioxidants), and contain some B vitamins, too. gojijuices.net has an interesting breakdown of nutrition info. Chia seeds seem to derive a lot of their nutritional heavyweight from the fact that they are super high in dietary fiber. They also contain ALA: an omega-3 fatty acid that is also found in walnuts, flax seeds, brussels sprouts and kale. 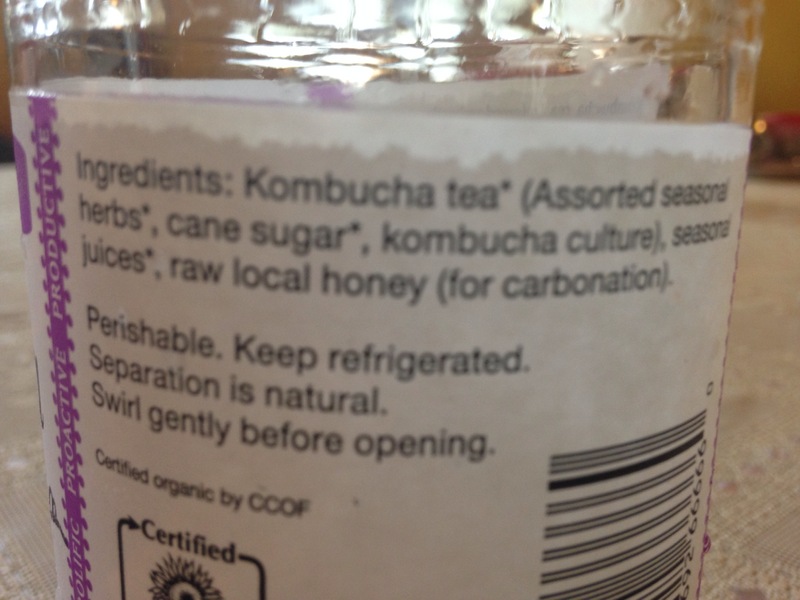 Kombucha’s biggest claim to fame is probably its debatable glucuronic acid content: an antioxidant that is supposed to be a major fighter of cancer. 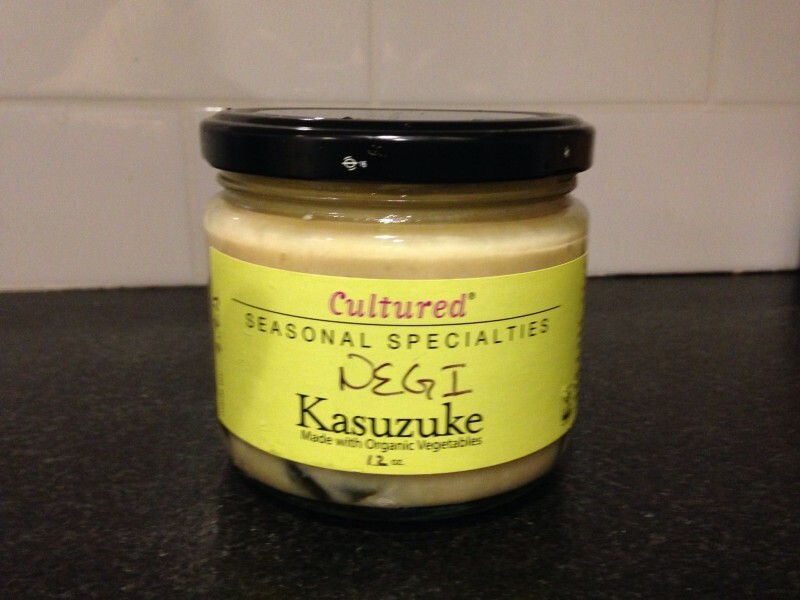 It’s also beneficial because it is undisputedly probiotic– the culture helps to give the gut good bacteria. I remember when I was first introduced to kombucha: Synergy’s Gingerberry flavor was my gateway drug, so to speak. Flavoring is certainly helpful if you want to convert a newbie to the kombucha club, as straight-up kombucha is an acquired taste. 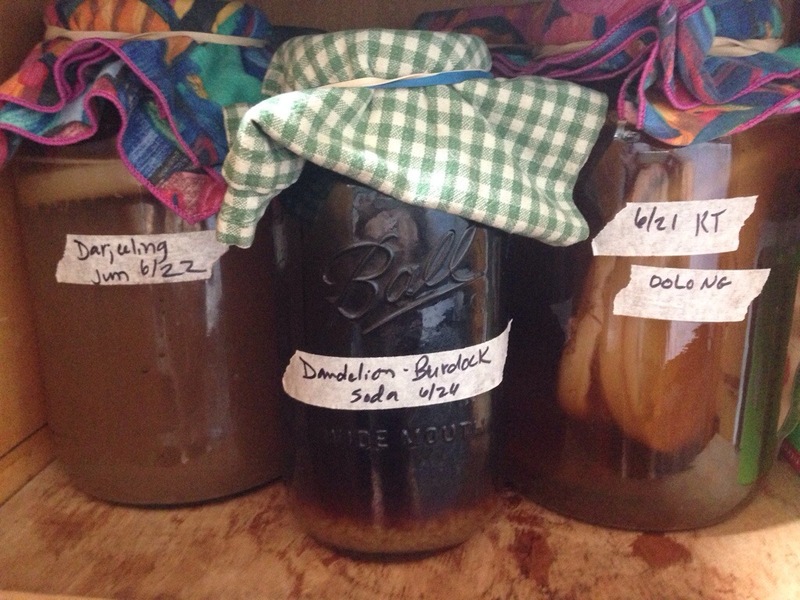 By the time you start making your own brews, you’ll probably already like kombucha enough that you don’t require extra flavoring, but it can be fun for variation. Also, herbs can give even greater therapeutic qualities to this already strong elixer of health. Hibiscus will make your kombucha turn a tempting red and develop a pleasant, fruity floral taste! 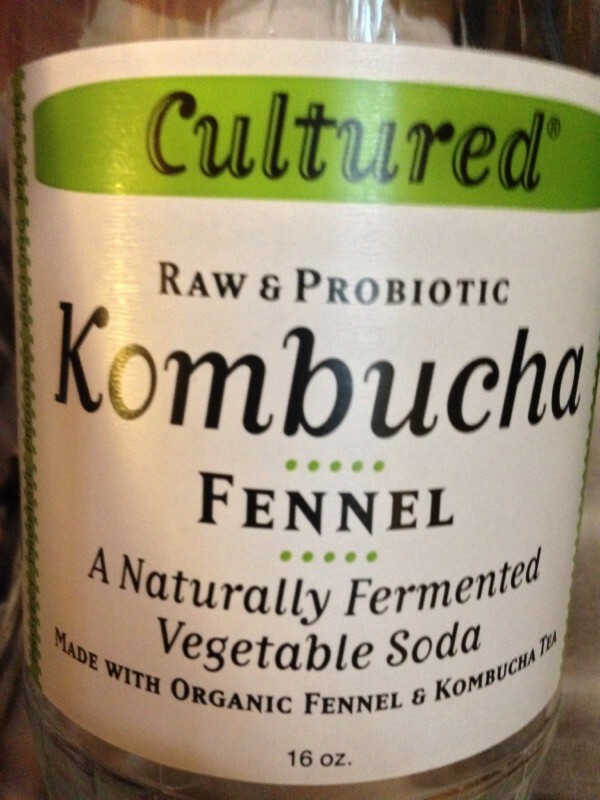 This is the only type of kombucha that my skeptic boyfriend will drink– I think it’s the red flavor that draws him in. When you drink it, you can strain out the hibiscus as you pour it, or if you’re like me, you might like to eat the hibiscus pieces. 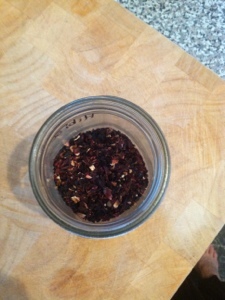 Hibiscus is high in Vitamin C. It is also mildly diuretic and laxative. I personally find it very helpful in reducing phlegm. Research has indicated that hibiscus might also help lower blood pressure. 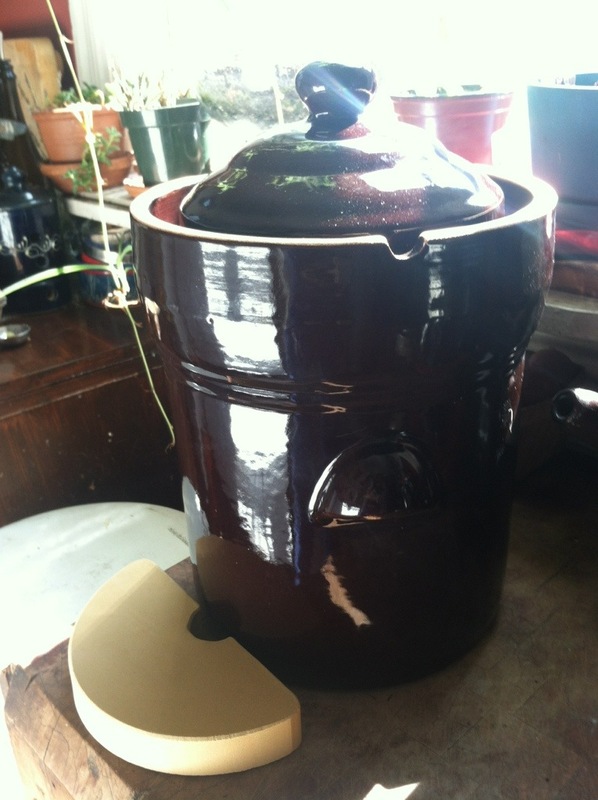 Elderberry: Get dried elderberries at your local herbal or health-food store. Put them in your kombucha. 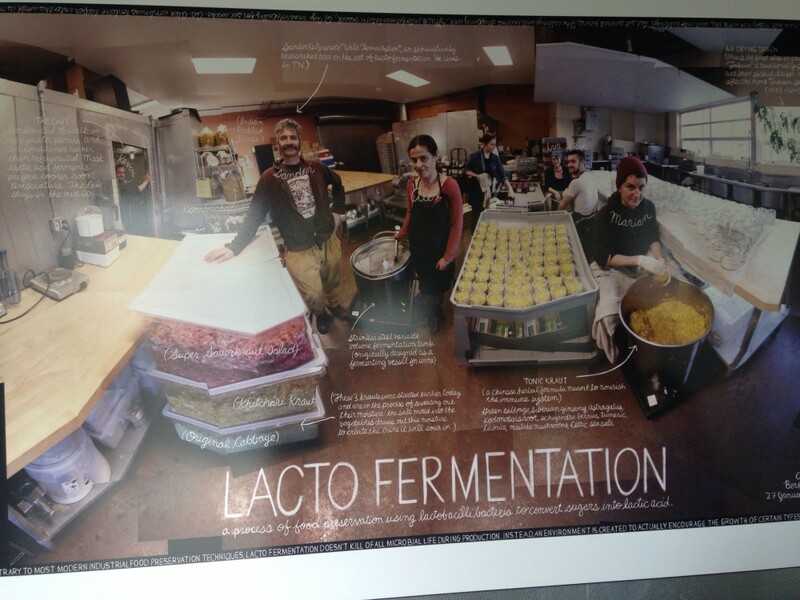 The brew turns purple! Elderberries are great for colds and the flu. 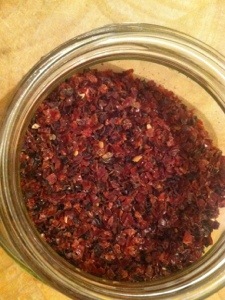 Rose hips: mildly fruity in flavor, these will add a boost of Vitamin C to your drink. They are another great way to boost your immune system against colds and infection. Also help with mild constipation and are a tonic for the gall-bladder. Ginger: Grate or finely chop fresh ginger root and toss it in. Ginger helps to make more fizz. 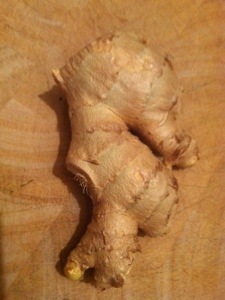 You can eat the ginger pieces or strain them out when serving. Ginger has a multitude of medicinal uses. It’s great as a digestive (promotes gastric secretions and tones the stomach) and for menstrual cramps and promoting menstruation. It is diaphoretic (aids the skin in eliminating toxins and promotes perspiration, therefore good for fevers), stimulant (particularly stimulates circulation)and is also indicated as soothing for sore throats.